It is believed by some researchers that perfume triggers natural pheromones in women’s bodies, which is why women in particular love perfume. Now even if this is true this is not the only reason women love perfume. Wearing the right perfume can also help get attention from males or even other females. It has been shown that nearly 80% of all women will buy perfume a minimum of once a year. Of course, many women purchase much more than that. Women will also say they buy perfume for themselves because it makes them feel good and it makes them feel more feminine and more attractive. This article investigates how you can make your own unique scent, particular to you. You will only need a bit of practice before you will be able to make a scent no-one else in the world will have. Think about that for a moment, how does that make you feel? People have been using scents, fragrances and aromas in general since time began. The actual origins are lost to us. The evidence we do have is that perfume making was a thriving business way back in the very early civilizations. This has been verified by early writings from these eras and by archaeological digs. We do know that the very early civilizations used scented flowers and herbs to worship their Gods. In addition, some of these fragrances were also burnt in order to release their scents. This is probably the origins of incense making, a related topic. These ‘scented fires’ became part of many religious ceremonies and this activity is still being practiced now among present day religions. Two of the very earliest civilizations, the Egyptians and the Assyrians used scented oils. This produced a demand for the raw materials needed for the scents and perfumes and also created the impetus to discover new methods and techniques to manufacture them. Techniques such as decoction, pressing, maceration and pulverization were some of the now basic techniques discovered and put into practice then. They even tried to produce essential oils by distillation. This industry eventually spread to ancient Greece where it looks like they were used for personal purposes as well as religious ceremonies. The Romans saw what the Greeks were doing and adopted these practices for themselves but the Romans always seemed to do things to excess and they used fragrances more lavishly than anyone else at that time. The Romans imported herbs from all around the known world to produce their fragrances. This is confirmed by the many manuscripts they left us. But, eventually, the Roman Empire fell. And with it fell the use of aromas for personal use. Perfume making for religious ceremonies remained important so perfume making did not disappear due to neglect. The European churches of the Middle Ages especially used incense and perfume for their religious ceremonies and also to mask the stench caused by the many diseases which were common at that time. The beginning of the 13th Century saw trade re-established with the Orient which meant that exotic flowers, herbs and spices became again readily available around Europe. In Europe, Venice quickly became the centre of the perfume trade, which developed even further those returning from the crusades reintroduced perfume for personal use. Modern perfumery can be identified as starting in the late 18th Century, because this was when synthetic perfumes started to be developed. Because of these synthetic products, perfume became far cheaper and available to more and more people. At the same time, also because of synthetics, perfumes could now be manufactured on a vast scale which pushed down the prices even further. But even now, with the dominance of synthetics perfumes, natural ingredients were still used to help soften the synthetics. Natural products are still important in modern formulations for this reason today. Nowadays, more and more people are turning away from the industrial techniques of producing perfume, and preferring to make it themselves instead. These people are finding not only is it easy to do, but it is also a great source of pleasure and fun for them. Making Perfume – What Can Perfume Be Made From? Any perfume you buy or make yourself is a chemical compound made from fragrant oils, aroma blends, fixatives and solvents, which produce a pleasant or attractive smell. Primarily women use perfume in order to smell nice if they are attending a special event, or to help attract a mate. The composition of any perfume starts with base perfume oils, which are natural, animal or synthetic, and are then watered down with a solvent to make them light and applicable. Unfortunately, perfume oils in either pure or undiluted form, can cause damage to skin, or an allergic reaction, so the adding of solvent is necessary to make them less potent. The most prevalent solvent used in the manufacturing of perfumes is Ethanol. Plants are the oldest source for obtaining fragrant oil compounds, and the parts used the most are the flowers and blossoms. But other plant parts, such as leaves, twigs, roots, rhizomes, bulbs, seeds, fruit, wood, bark and lichens, can also be considered for use in perfume making. Perfumes which have been made using animal sources are normally made from Musk, which is obtained from either the Asian Musk Deer or Civets (known as Civet Musk), as well as Ambergis (a fatty compound). Some perfume makers may also use either Castoreum or Honeycomb in the production of their perfumes. As for synthetic source perfumes, these are produced through organic synthesis of multiple chemical compounds, and such things as Calone, Linalool, Coumarin and Terpenes are used to make synthetic fragrant oils. By using synthetic products in perfume making, you can produce smells which are unnatural (not even existing in nature) and these have become a very valuable element in modern perfume making. Perfumes are made by businesses to attract the customer via the olfactory system (through the sense of smell) in order to persuade them to buy the perfumes or perfume laced products these businesses are producing. Unfortunately, fragrance compounds will, after time, begin to deteriorate and lose strength if stored incorrectly. It is therefore important when thinking about making your own perfume, that you store them in tightly sealed containers, and keep them out of light and away from heat, as well as away from oxygen and other organic substances. If you want to get the best results possible the containers should be stored in a fridge at a temperature of between 3 and 7 degrees Celsius. Today more than ever, perfume is popular around the world because both its use and application continues to grow. Now we will look at a few simple ways in which you can make your own perfume for next to nothing. Research has shown that you can actually make a 100 bottles of perfume and sell them for up to fifteen times the cost of making it. Certainly some of the most profitable perfumes that are now available are ones which have not cost much to produce. Previously when people were looking to produce their own perfume it was very difficult to find the ingredients, along with the packaging (bottles, spray nozzles etc). But this has all now changed due to the internet and being able to order things online. Today you will find that you can obtain the ingredients you need at a reasonable price, and have the order sent directly to your home address. You first need to think of a name for your perfume (something catchy so people will remember it). Now you have the name, you need to design a label (simple artwork would be best). Next you need to look at what kinds of ingredients you will require, and make a list. Search for the best types of bottles, lids and pumps that you will need to put your perfume into (spend a little more on this item); you want your perfume to look good. Next you will need to spend a couple of days choosing your fragrances. It is important that you carry out as much research as possible on any other ingredients that you should use. When preparing the ingredients, it is important that you are in a sterile environment before pouring the perfume into the bottles you have chosen and bought. Finally, look at a way in which you can present the finished product to customers (assuming you want to sell it)… it may be in a box, or you may find a much more creative way doing this. As you can see producing your own perfume is a simple process and if it is something you have always considered doing then why not give it a go. Making perfume is something you can easily do yourself at home as you can see. You can make it for yourself, for gifts, for your family or even to sell. The important thing is to enjoy yourself. It’s easy to get yourself started, just do a Google search on “making perfume” and you’ll find a wealth of information detailing all the many methods and recipes there are available for you to choose. But before you even do the search you should consider what sort of perfume you want to make. Would it be an eau de cologne, perfume concentrate or even an aftershave? Secondly, you need to decide what it should smell like? Do you want it to be soft or strong, sweet or manly or unisex? Does it have to be long lasting? These steps are important and should not be omitted. So now you are in the position of knowing what you want you need to start making a list of the ingredients that you need. Think about the characteristics of the various ingredients that you want to include in your recipe. But, if you already have a recipe that you would like to use, you do not need to bother experimenting with the ingredients you have (although it would be wise to adjust the quantities of the ingredients in order to personalize your perfume. However, if you do not have your list of ingredients already prepared, then there are a couple things that you should know before making your list. First, when making perfume it is important that you experiment as much as you can. Remember that perfume making is an art, so imagination and a great sense of smell will help you to overcome your lack of knowledge or experience. Aromatherapy Essential Oils (these have been extracted from various plants (organic or non-organic)) and when combined give the smell of the perfume you are trying to produce. 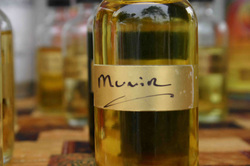 There is another thing that you should know concerning oils used in perfumes. That is that there are 3 different types of oils, and these will ultimately influence the smell of perfume over time. The Base Oil (Base Notes) – This will produce the scent that stays longest on the skin and for this reason it is usually added to the mixture first. The Middle Oil (Middle Notes) – This also influences the smell of the perfume for quite some time, but not as long as the base notes. Top Oils (Top Notes) – This is added to the mixture after the middle notes, and may then be followed by some other substance which will help to bridge the scents together. It is very important that when you are making perfume, you mix the extracts in the above order, and that you use enough of each type (usually equal amounts) in order to produce the right sort of perfume. Here are a list of oils that are easily obtainable and which will help you to produce the perfume of your dreams. Now that you have read the above and considered all the possibilities it is time to start making your own perfume. Making Perfume – Where Do You Get Your Supplies And Exactly What Supplies Do You Need? Now you’ve decided to start making your own perfume, so here are a few ways of obtaining the supplies you need. First and obviously, you need to decide on your formulation (recipe). The exact formulation is the reason why perfumes differ so it’s necessary to choose a good one. Decide what kind of perfume you want to make then read through the recipe and verify it will produce the results you want. One major ingredient is the essential and fragrant oil available to you. Choose ones of good quality, the best you can afford. Basically, the better the oil the better the perfume, as these oils will establish the perfume’s inherent attributes, like mood, quality and character. Unfortunately, essential oils are much more expensive than fragrance oils, so if this is your first attempt, it may be wise to just use fragrance oils until you’ve become more skilled. Your health is also a factor you should consider now. There are some health risks associated with essential and fragrance oils. There may be some formulations or recipes which could cause health problems if the oils included in them are used incorrectly. Perfumes made today are not made with fragrance or essential oils alone, because alcohol is also used as the primary solvent (helps to reduce the strength of the oils). It is important that you use the right materials not just for measuring, but also for handling, mixing and storing the finished product. It is essential you do not use utensils you already have in your kitchen (ones for measuring water or food items), because they are not suitable for measuring the fragrance oils, alcohol and other such solutions required to make perfume. It is better that you use specific measuring devices that allow you to exactly measure out the amounts of oils and solvents required. If you don’t, the perfume you make may not be what you wanted and if it is, you won’t be able to repeat the process next time. It is best if you use measuring devices made from glass so that you can see what is inside and when handling any formulas (i.e., transferring them to storage bottles or other containers), then use a funnel with a narrow long neck. You will also need fixatives, which are used with the other ingredients in order to lower the rate of evaporation of the fragrance or essential oils. If only a (relatively) small amount of fixative is used, your perfume may lose its fragrance faster than it should. Once you have gone through the recipe, you will know exactly what you need to make your perfume, so where do you get these ingredients? You may be able to get them from a shop in your area. You could also go online, as there are plenty of places which sell perfume kits. Google for “perfume kits”, and you will soon see what is available. Here are a few easy recipes you should be able to produce at home without too much hassle. After a period of 12 hours or more, the solution produced can be put into a dark spray bottle to be used. Using a dark coloured bottle will help the solution to remain fresh, which will be felt by the person using it when they apply it to their skin. Stir the ingredients together and store overnight in a covered container. Then, the next day, transfer it to a dark coloured bottle. This perfume must be kept in a cool place so that it does not dry up. The three perfumes above normally last for about a month before they lose their scent. This next recipe should produce something a bit better. For this recipe, you will need fragrance oils such as Sandalwood, Cedar Wood, Bergamot, Vodka and a little touch of Vanilla. All these ingredients should be put into a jar and then shaken. It should then be put in a cool place and left for a week. After this time, you can then transfer the mixture into small perfume bottles. You really need to understand this. If you are tempted to use the Vodka in ways other than for perfume making, you really MUST make certain you drink it AFTER you’ve finished making your perfume.